With a dark rich finish and straight-lined contemporary design, the “Hyland” dining room collection features a stylish look that is sure to transform the atmosphere of any dining experience. The deep reddish brown finish flows beautifully over the slightly tapered legs and sleek streamlined table that perfectly captures the true essence of exciting contemporary furniture. With the stylish chairs featuring shaped wood seats and smooth slat backs, this dining room collection fits flawlessly into the decor of any dining room. 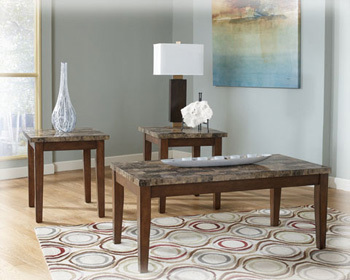 Liven up your home with the sharp contemporary flair of the “Hyland” dining room collection. 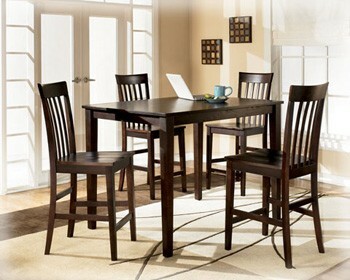 Lease this beautiful Dinette for only $12.99+Tax Weekly or $52.00+Tax Monthly. Purchase Price is Only $499.99+Tax or Take advantage of our 90 Day Same As Cash Program! Special of the Month is 1/2 Off your First Lease Payment! See store for more details. With a stream-lined contemporary design brought to life by the rich gloss finish, the “Pascal” TV pedestal takes the best from Metro Modern design to create the perfect addition to any living area. 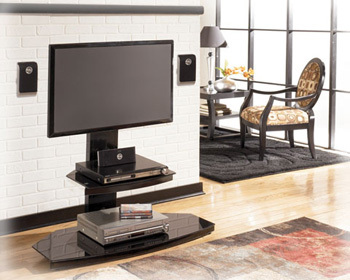 The sleek tubular metal construction features a gloss gun metal color powdercoat finish perfectly accented by the black print glass shelf tops making this exciting TV pedestal truly enhance the beauty of any home. With the side-to-side swivel of the TV mounting bracket, the “Pascal” TV pedestal is a functional addition to your living area as well as artistically beautiful for your home’s decor. Lease this Modern Contemporary quality made Ashley TV Stand for only $5.99+Tax Weekly or $24+Tax Monthly. Purchase Price is Only $239.99+Tax or take advantage of Premier rental Purchase’s 90 Days Same As Cash. You will Receive 1/2 Off your First Lease Payment when you mention this Posting! Acer, Toshiba, and many, many more brands available. 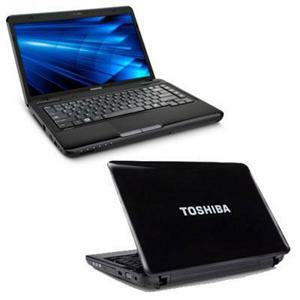 Windows 7, CD/DVDRW, Web Cam, WiFi, USB, Carrying Case all included. Also, our on site service tech is available Monday-Friday to answer questions or service any problem that you may have. Lease the Entertainment Package for $27.99+Tax Weekly or $112+Tax Monthly. Get $50 Off Your First Months Payment or Pay 1 Week, Get 1 Week Free! Find Us Online at: http://www.premierdayton.com —– Also, “Like” us on Facebook at: http://www.facebook.com/daytonpremier to register to win 2 Free Large Pizzas. 1. Free Setup – We will setup our merchandise in your home so that it is ready to use. Some exceptions do apply. See store for more details. 3. We have a wide variety on our online Catalog available to be ordered. 4. All our products are Brand Names you know. 5. Extended Warranties – Premier offers up to a 1 year warranty on the merchandise once you have purchased the item. See store for more details.